Can you spot what’s wrong with this game? It took my 3 year old less than five seconds to discover the problem with this game. In spite of not really understanding the point of tic-tac-toe. 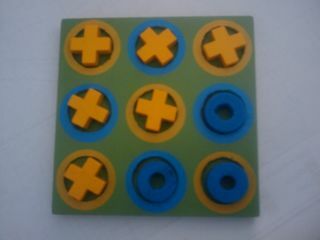 Fairly obvious: you need 5 of each kind of piece to play Tic-Tac-Toe, not six of one and three of the other. hence to cover both possible outcome, the game need to be supplied with 5 “X” and 5 “O”.